State Library Victoria is the central library of the state of Victoria, Australia, located in Melbourne. It was established in 1854 as the Melbourne Public Library, making it Australia's oldest public library and one of the first free libraries in the world. The Library's vast collection includes over two million books and 350,000 photographs, manuscripts, maps and newspapers, with a special focus on material from Victoria, including the diaries of the city's founders, John Batman and John Pascoe Fawkner, and the folios of Captain James Cook. It also houses some of the original armour of Ned Kelly. The Library is located in the northern centre of the central business district, on the block bounded by Swanston, La Trobe, Russell, and Little Lonsdale streets. In 1853, the decision to build a combined library, museum and gallery was made at the instigation of Lieutenant-Governor Charles La Trobe and Mr Justice Redmond Barry, Q.C. (Sir Redmond from 1860). A competition was held, won by the recently arrived architect Joseph Reed, whose firm and its successors went on to design most of the later extensions, as well as numerous 19th-century landmarks such as the Melbourne Town Hall, and the Royal Exhibition Building. On 3 July 1854, the recently inaugurated Governor Sir Charles Hotham laid the foundation stone of both the new library complex and the University of Melbourne. The library was the first stage opened in 1856, with a collection of 3,800 books chosen by Mr Justice Barry, the President of Trustees. Augustus H. Tulk, the first librarian, was appointed three months after the opening. The Melbourne Public Library as it was then known was one of the first free public libraries in the world, open to anyone over 14 years of age, so long as they had clean hands. The complex of buildings that now house the Library were built in numerous stages, housing various library spaces, art galleries and museum displays, finally filling the entire block in 1992. The first stage was the centre of the front block, opened in 1856, with most of the front wing, along with the floor Queen's Reading Room (now Queen's Hall) complete in 1864 by Abraham Linacre. Other wings were built are various time, such as Barry Hall, along Little Lonsdale Street, in 1886, McCoy Hall (now the Redmond Barry reading boom), built for the Museum in 1892, Baldwin Spencer Hall facing Russell Street in 1909, and the McAllan Gallery on the LaTrobe Street side, built in 1932. Temporary buildings were built in 1866 for the Intercolonial Exhibition of Australasia just behind the front wing, which remained in use until 1909, when work began on the library's famed Domed Reading Room, opened in 1913, designed by Bates, Peebles and Smart, the successor to Reed's firm, now known as Bates Smart. In 1959, the dome's skylights were covered in copper sheets due to water leakage, creating the dim atmosphere that characterised the Library for decades. The National Gallery of Victoria moved to new buildings in St Kilda Road in 1968, and the Melbourne Museum moved to the Carlton Gardens in 2000. The library underwent major refurbishments between 1990 and 2004, designed by architects Ancher Mortlock & Woolley. The project cost approximately A$200 million. The reading room closed in 1999 to allow for renovation, when the skylights were reinstated. The renamed La Trobe Reading Room reopened in 2003. The redevelopment included the creation of a number of exhibition spaces, some of which are used to house permanent exhibitions The Mirror of the World: Books and Ideas and The Changing Face of Victoria as well as a display from the Pictures Collection in the Cowen Gallery. As a result of the redevelopment, State Library Victoria can now be considered one of the largest exhibiting libraries in the world. In February 2010, the southern wing of the library on Little Lonsdale Street was reopened as the Wheeler Centre, part of Melbourne's city of literature initiative. In 2015 the Library embarked on a five-year, $88.1 million redevelopment project, Vision 2020, to transform its public spaces, programs and facilities to better meet the changing needs of the community. On 29 April 2015 the Minister for Creative Industries Martin Foley announced that the 2015–16 State Budget would provide $55.4 million towards the redevelopment of State Library Victoria, including the restoration of the Queen’s Hall, the creation of a rooftop garden terrace, a dedicated children’s and youth space, and the opening up 40 percent more of the building to the public. In late 2017, the library's contribution of $27 million from donations was eventually raised. In September 2018, the main Swanston Street entrance is temporarily closed and replaced by the newly refurbished Russell Street and La Trobe Street entrances. The grassy lawn in front of the library's grand entrance on Swanston Street is a popular lunch-spot for the city's workers and students at the adjacent RMIT University. Originally enclosed by a picket fence, then by a wrought iron fence and gates in the 1870s, the space was opened up with the removal of the fence and the creation of diagonal paths in 1939. The forecourt includes a number of statues. A pair of bronze lions flanked the entry from the 1860s until they were removed in 1937 due to deterioration. A memorial statue of Mr Justice Sir Redmond Barry, Q.C., by James Gilbert and built by Percival Ball was installed on the central landing of the main stairs in 1887. Flanking the entrance plaza are Saint George and the Dragon, by the English sculptor Sir Joseph Edgar Boehm, installed in 1889 and Jeanne d'Arc (Joan of Arc), a replica of the statue by French sculptor Emmanuel Frémiet, installed in 1907. WW1 commemorative statues ‘Wipers’ and ‘The Driver’ were at the centre points of the 1939 diagonal paths were relocated to the ground of the Shrine of Remembrance in 1998. A statue of Charles La Trobe, by Australian sculptor Peter Corlett, was installed in 2006 in the north east corner of the lawn. On Sundays between 2:30 pm and 5:30 pm, a speakers' forum takes place on the library forecourt, where orators take turns in speaking on various subjects, and it is popular location for protest meetings and a rallying point for marches. The landmark Domed Reading Room was opened in 1913, and was designed by Norman G. Peebles of Bates Smart. Its octagonal space was designed to hold over a million books and up to 600 readers. It is 34.75 m in both diameter and height, and its oculus is nearly 5 m wide. The dome was the largest in the world on completion. In 2003, it was officially renamed the LaTrobe Reading Room, and now houses the Library's Australiana collection, previously in the 1965 La Trobe Building annex. The library has a chess room that houses a wide range of materials dedicated to the history, study and practice of chess. It contains a collection of items from the Anderson Chess Collection, one of the three largest public chess collections in the world. In addition to bookshelves containing an extensive range of books and periodicals relating to chess, the room has game tables with chessboards and pieces, and a few glass cabinets containing historical chess paraphernalia. The room is a multi-purpose room intended also for reading and studying. The Chess Room was temporarily closed in February 2017. Chess games sets and the chess collection are available in the La Trobe Reading Room until the collection moves to its permanent home in Ian Potter Queen's Hall in 2019. This place is located at the eastern end of the Library. Houses contemporary collection of books, magazines, and periodicals. The centre of the room has internet enabled computers and shared desks. The mezzanine has folio-size books and more independent study desks. The ceiling has glass panels. The reading room is easily the busiest room during pre-exam period in Victoria. Entry to the room is by appointment. The room itself does not hold any collections, rather it is a place to view heritage collection materials. There are 14 historical pendant lamps hanging off the ceiling and a detailed ceramic embossed wall and ceiling. Map bags are the only collection of materials held in HCRR and consist of copies of maps of metropolitan Melbourne between the 1800s to 1900s and no appointment is required to see them. The library maintains an extensive, world-class collection of books, periodicals, recordings and other materials pertaining to art, music and the performing arts. The room is built in a courtyard hence the angular shape of the room. The main room includes computer workstations which provide access to the Library’s catalogue, databases and the web, reading tables, laser printer, photocopier and a microfiche reader. It also has an audio visual room and listening posts. Located in one of the courtyards, the room has extensive collection of microfilms and microfiche, printed references, databases, and biographies. There are many facilities available such as computers and a laser printer. Located in one of the courtyards, the room holds microfilm of Victorian, interstate, and some international newspapers. There are modern microfilm and scanner readers enabling patrons to save images of newspapers to USB memory stick. Also, three months' worth of physical copies of Victorian newspapers are kept in the room. There are facilities in this room to help with research. The library holds a significant amount of material related to bushranger and outlaw Ned Kelly, most notably the armour he wore during his final shootout with the police. Founded by the Friends of State Library Victoria in 1968 to promote interest in the Library's Australiana collection, in 1998, the State Library Victoria Foundation became the sponsor of the journal, enabling the publication to expand considerably. As of 2013[update] it is published twice a year in Autumn and Spring. Many of the library's electronic databases are available from home to any Victorian registered as a State Library User. Databases include the full Encyclopædia Britannica; Oxford Reference dictionaries and encyclopaedias; multi-subject magazine and journal article databases; newspaper archives of most major Australian and international papers from 2000 onwards; and specialist subject databases. The library's collection includes 2,000 rolls of film containing photographs of Melbourne and country Victoria from the early 1970s. These 70,000 photographs are in the process of being digitized and made available to the public. State Library Victoria provides education programmes for community and schools, conferences such as Reading Matters and library research fellowships. The library is home to the Centre for Youth Literature and the Inside a dog young adult fiction community. From 1994-2014 it managed the Vicnet community internet service. The exterior of the library is prominently featured at the conclusion of the post-World War III movie On the Beach. "State Library Victoria". Libraries. National Library of Australia. Retrieved 2008-10-21. ^ "The history of the State Library of Victoria: The Basics". State Library Victoria. Retrieved 5 November 2017. ^ "The history of the State Library of Victoria : Timeline". State Library Victoria. Retrieved 5 November 2017. ^ "State Library of Victoria". Victorian Heritage Database. Retrieved 5 November 2017. ^ "State Library of Victoria to receive $83 million facelift". ABC news. 29 April 2015. Retrieved 5 November 2017. ^ "Read-y or not, State Library of Victoria transformation to start". The Age. 4 September 2017. Retrieved 5 November 2017. ^ "Forecourt". The history of the State Library of Victoria. State Library of Victoria. Retrieved 30 August 2017. ^ "The Mysterious James Gilbert, The Forgotten Sculptor 1854–85". The La Trobe Journal. No 54, March 1995. State Library Victoria. Retrieved 6 March 2019. ^ "Driver & Wipers Memorial". Monument Australia. Retrieved 30 August 2017. 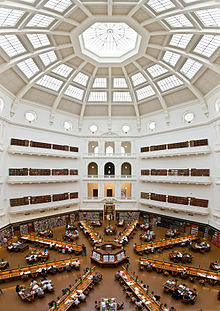 ^ "The history of the State Library of Victoria". Statues and Murals. State Library of Victoria. Retrieved 30 August 2017. ^ Lewis, Miles (Spring 2003). "The Dome". The Latrobe Journal. 72: 58. Archived from the original on 2015-03-24. ^ "The Dome". The history of the State Library of Victoria. State Library of Victoria. Retrieved 30 August 2017. ^ "About - The La Trobe Journal". State Library Victoria Foundation. Retrieved 11 October 2013. ^ Stayner, Guy (18 November 2015). "State Library makes public up to 70,000 never-seen photos of Melbourne and country Victoria". ABC. Retrieved 24 November 2015. ^ "Literature, Art and culture, Melbourne, Victoria, Australia". Victoria. State Government of Victoria. Department of Innovation, Industry and Regional Development. Retrieved 2016-07-15. ^ Shuttleworth, Mike (2007). "Inside a dog". Connections (60). ^ "Winners » ANZIA - Australia & New Zealand Internet Awards". www.anzia.org.au. Retrieved 2016-07-15. Wikimedia Commons has media related to State Library of Victoria. The history of the State Library Victoria State Library Victoria accessed 23 March 2015.